Artisans from Bayana town of Bharatpur are busy carving stones imported from Turkey which will be used to construct the Akshardham Temple at Robinsville city in the US state of New Jersey. The temple is being constructed by Swami Narayan Temple Trust of Ahmedabad. Other than New Jersey, Rajasthani artisans, especially from Bayana in Bharatpur and Bhandarez in Dausa, are receiving orders to carve stones from the other states of the US. At least 39 artisans from Bayana are engaged in carving stones to be used in various temples. The temple administration has also taken help of artisans from other cities such as Pindwara in Sirohi and Bhandarez in Dausa. "They are the best. In most of the temples that use pink sand stones, the carving work is being done by artisans from Dausa, Bharatpur and Sirohi. Various types of artisans are required for the job. For example, for idols, artisans from Dausa and jaipur are good. 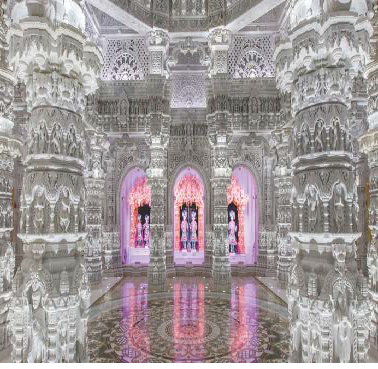 Likewise, for various designs on stones used in interiors and exteriors of the temple, the carving is done by artisans from Bayana", said Chintan Patel, a caretaker of the temple. He added that the work of these artisans has been appreciated everywhere. "It is not feasible for us to bring them to the US for stone craving. Rather the stones are sent to them for carving. Stones of various shapes are exported and assembled in the temple" he added. Artisans and people involved in the trade are also using websites to increase their global presence. "Many people get our numbers from websites and we have carved stones for temples in various parts of the US. All work assigned is completed on time", said Mulkh Raj, a businessman associated with the stone carving trade in Bayana.